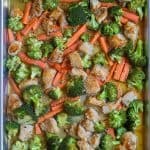 Flavorful chicken baked with veggies for a simple one pan dinner! 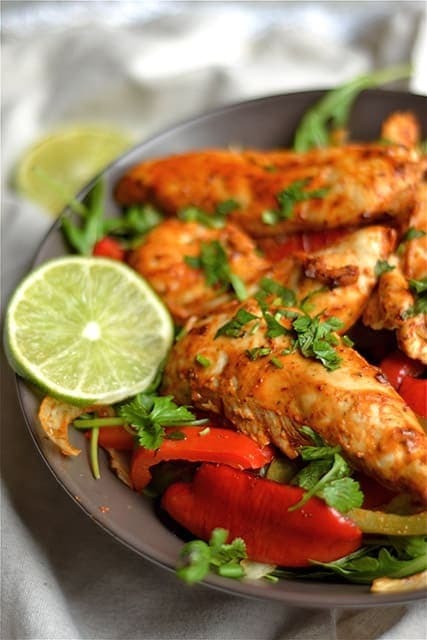 These Chipotle Cilantro Chicken Fajitas are sure to please anyone and can be made in less than 30 minutes! I can’t remember the last time I made a meal that was labor intensive and took me longer than 30 minutes. I’ve given them up! My New Year’s resolution is to make tasty meals that are super easy with little prep time. This mama is busy, but vows to have healthy and fresh dinners almost every night. And no, that doesn’t mean my slow cooker or Instant Pot all the time. 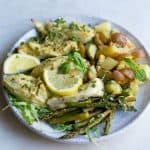 One pan dinners are also my jam! 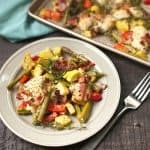 I love these sheet pan dinners where the vegetables and meat roast altogether. And Mexican food is always my favorite. So some of you know that this month we’re going Whole30. We eat Whole30 meals all the time, but haven’t committed to a full 30 days yet until now. 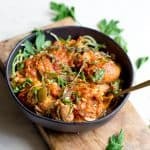 This was our second dinner of our Whole30, and one that I definitely want to make over and over again! It’s easy to to let the kids enjoy with tortillas or over rice (hello Taco Tuesday), and for me and Mr. Wholesomelicious we ate over roasted sweet potatoes with lots of extras (avocados, salsa). So good you guys. Another way? 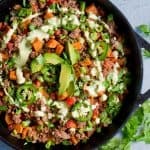 How about over Spanish flavored Cauliflower rice in a big bowl of goodness with my Avocado Cilantro Sauce or Best Salsa Ever? I’ll get on a recipe for Spanish Cauliflower rice ASAP. 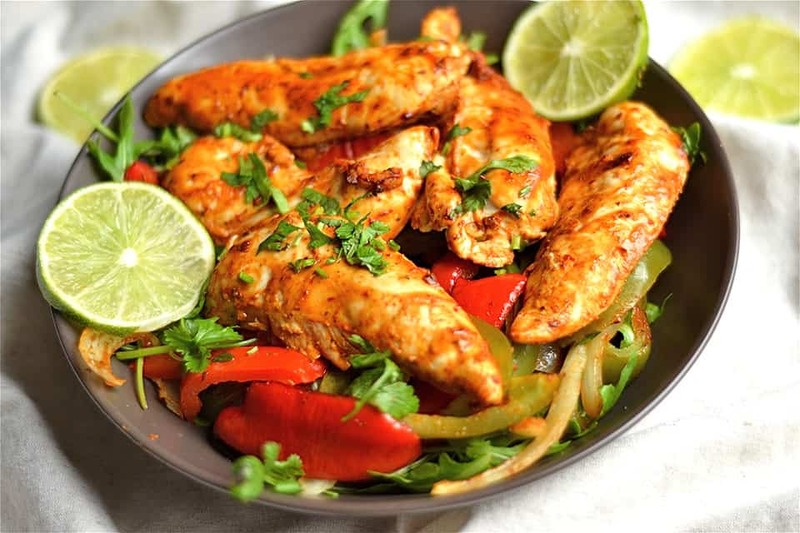 I marinated my favorite flavors together for this delicious sauce! Chipotle peppers and cilantro just make for a tastier life in general. And when I say marinade, I want to make it very clear that you can honestly whip this up 5 minutes before it goes in the oven. Just be sure to coat the vegetables with the same sauce. You can double this sauce and use more for a later use (you may be licking the plate and wishing you had more). Another idea is to reserve any extra sauce and add some more olive oil or avocado oil to use for a salad dressing. Preheat your oven to 375 degrees. 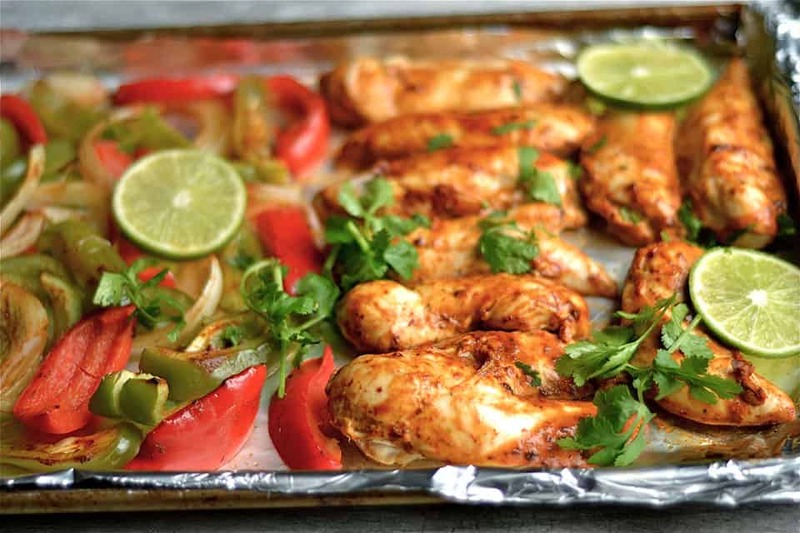 Line a large baking sheet with foil and set aside. 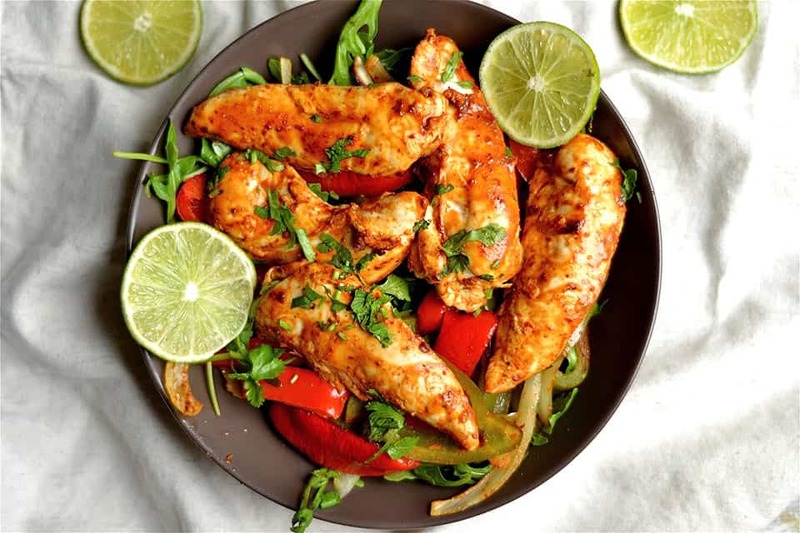 Make your marinade by adding all ingredients to a blender or food processor. Pulse until smooth. Place your chicken tenders in a container with a lid or a large ziploc bag. Add about half of the marinade to the container or bag and shake to coat the chicken. 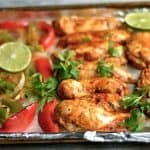 Place chicken on the sheet pan in an even layer. Add peppers and onions. Use some more marinade to brush the veggies. Season with a bit of salt and pepper. 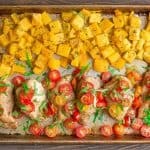 Place sheet pan inside the oven and bake for 15 minutes. Bump up the temperature to 425 and cook for another 5-10 minutes (depending on size of chicken). Remove from oven once chicken is cooked all the way through. Serve immediately in tortillas, over rice or cauliflower rice, over greens, or sweet potatoes. Looks delicious! Do you usually find your chipotle pepper at your local grocery store, or do you have to go somewhere specific? Thanks! Hi Mindy! Chipotle peppers in adobo sauce can be found in almost every grocery store in the Mexican food section. I love that your recipes have ingredients that I usually have on hand. 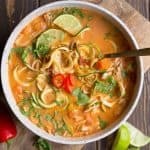 So refreshing to be able to look at a recipe and say “I can make that tonight!” Thanks!